Reduce hot end variability. Improve efficiency. Minimize product changeover time. For over 30 years, ControlSoft has been helping glass manufactures boost the efficiency of their plants, optimize their processes, and respond more quickly to current market requirements with fast ROI (Return On Investment). We supply innovative technology solutions for glass processing – find out how you can save energy and resources as well as cut operating costs, without compromising on product quality. We have a team of dedicated project and support engineers with vast experience in the glass industry who provide a full range of project services, delivering the best process consistency across all of your plants. This team has developed a methodology for implementing advanced process control without disrupting your current operation; improve your plant operations in a safe, secure, and field-proven manner. Our scalable process control solutions are ideal for the efficient operation of high-energy glass processes. See how we’ve used our MANTRA Advanced Process Control Solution in Glass applications. Our glass manufacturing and control experts can help you deliver consistent, high-quality end product at an optimized rate, with precision heating and cooling strategies designed specifically for your application. 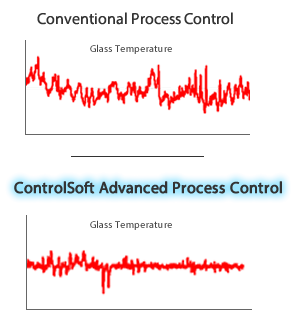 Implement tighter control to reduce glass temperature variability and improve product quality. Stabilize your forming process by providing uniform, consistent, and repeatable glass delivery. Measure energy consumption and make improvements to increase your bottom line. Optimize production line changeovers to effectively utilize equipment and increase revenue. Reduce unpredictable temperature changes and keep defects to a minimum. Eliminate rework to achieve the lowest production costs possible. Apply advanced process control strategies to extend the life of existing assets.